Dom Marsala scored twice as Leighton Town got back to winning ways on Saturday, beating Cockfosters 3-2. Town’s undefeated SSML Premier Division record came crashing down on Wednesday though when they were soundly beaten 2-0 by Hadley - ending their unbeaten run which had stretched back to November 25 last year. That defeat saw them drop to fourth in the table though, now behind Harpendon, albeit with a game in hand. But the gap to the top two now sits at 10 points with 11 games remaining. 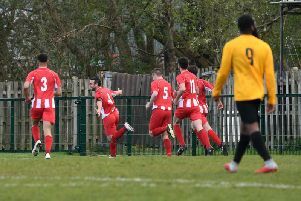 It appeared Scott Reynolds’ side would slip further off the pace of the leaders when they squandered a 2-0 lead at Cockfosters on Saturday, but it was a frantic opening quarter of an hour. Marsala netted the opener after just five minutes, before Lorrell Smith netted his 16th goal of the seasonbarely three minutes later to put the visitors firmly in control at Chalk Lane. But the home side pulled one back on the quarter hour mark - the first of Claudio Tipote’s brace - to make it 2-1. And so it stayed until the interval, but Tipote needed just two second half minutes to draw Cockfosters level. But Marsala would have the last laugh, netting late in the day for Town to secure all three points, keeping up with the pace of the leading trio, remaining in fourth, just a point behind Harpendon. Town’s busy schedule sees them in action again tonight (Tuesday) away at 17th place Oxhey Jets.